The year 2017 has been a busy one for RIP Medical Debt and – with your financial help – 2018 is destined to be even busier and more impactful. Here’s our year-end review and our vision moving forward. RIP received national attention when we were featured on John Oliver’s Last Week Tonight Show on June 16, 2016. 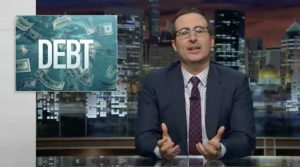 The “John Oliver Effect” – as we like to call it – continued to reverberate through 2017 and provided RIP with wonderful opportunities to continue our work of helping eliminate medical debt for struggling Americans. I will elaborate on that below as I invite you to view the John Oliver film clip once again and consider a stronger role in partnering with RIP and including as as part of your charitable giving. RIP held four mini-summits in 2017. The Last Week Tonight Show enticed researchers from four major universities to contact RIP and attend a January mini-summit in NYC to meet with RIP’s founders and their technology partner, The Number. This led to a second NYC mini-summit on June where the university team formally launched a first-ever economic impact study of the effects of eliminating medical debt. This was followed by an invitation from TransUnion to hold a third mini-summit in September to meet with their data scientists at the offices of TransUnion Healthcare in Chicago. Our TransUnion strategic partnership will enable RIP to use “data for good,” as TU puts it in their motto, while we are cleaning up people’s credit reports with our debt purchases. Also attending was RIP’s newest technology partner was OBASHI, who will tightly lock up that data in keeping with HIPAA requirements. The fourth mini-summit was held in NYC in November, the day before Veterans Day, with a very special focus on the creation of a 2018 campaign to forgive $50M of medical debt owed by U.S. veterans. This debt is the result of inconsistent, or nonexistent, VA healthcare coverage. It’s hard to believe that more than $8 billion of medical debt shifted to our military when the VA denied coverage for emergency transportation and ER visits. Fourteen campaigns in 2017 raised more than $350,000 and these campaigns are ongoing and will raise another $150-200,000 in 2018. The Minnesota Nurses Association as well as the Michigan Nurses Association working at Sparrow Hospital in Lansing raised money within their own ranks (a total of nearly $30,000) to forgive $3.6 million in medical debt for families in their states. Budgets are being put in place by the the Minnesota nurses to forgive more than $5 million in debt in Iowa and Wisconsin in 2018. RIP is an essential element in an initiative recently started by physicians launching a Campaign to End Medical Debt in southern California. The intention is forgiving some $5 million in medical bills in Los Angeles and Ventura counties. This debt abolition will be combined with quality improvement training for health care professionals to address the underlying medical and social issues(“upstreaming”) that brought about the debt. Front end prevention; back end forgiveness. In an amazing precedent, a Michigan court this fall approved a Cy Pres class action settlement against a hospital’s collection firm for $500,000. The funds awarded will be used to enable RIP to abolish medical debt within that state for the class. Instead of each member of the 622,000 class receiving a check for 62 cents, the funds will be dedicated to abolish as much as $40 million of their unpaid medical bills. Viewing the John Oliver film clip in the courtroom led to RIP being their wonderful choice. We cannot count on the John Oliver effect to continue unabated (although we understand through our PR firm chief, Dini von Mueffling at DvM Communications, that RIP may be featured on the NBC Nightly News in early 2018). This is where your continuing support comes in – a steady stream of donations we can count on to replace a once-or-twice-in-a-lifetime tsunami of national television that catches people’s attention. RIP invites you to support our mission to raise funds helping us locate, buy and then forgive millions of dollars in unpaid and unpayable medical debt for ur fellow Americans. Since our launch on July 25, 2014, we have lifted almost $50 million in medical debt being from the backs of our fellow Americans, which included some $10 million in medical debt owed by active duty military and veterans. This is your opportunity to explosively multiply the impact of your financial investment in our work. RIP’s industry-insider savvy and our our 501(C)(3) tax status allows to purchase medical debt for a penny on the dollar. Each $1 eliminates $100; each $1,000 eliminates $100K, and each $10,000 eliminates $1,000,000. That kind of impact is an unparalleled philanthropic ROI for donors. So, if it’s good you want to do, and you want to do the most good that you can as effectively as you can, there’s no better organization than RIP to entrust with your charitable dollars. You can donate here. Wishing a wonderful and prosperous New Year to all.